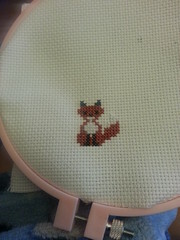 Sure I could have gone to bed, but he was too cute to not stitch up all quick-like. He seems a cheerful fellow! Will that be part of a larger piece, or is he just kinda hangin’ out in the Void, as foxes do? He’s just kinda hanging out. I may try to make him bigger or string a few together. I’m still new at needlepoint.